One of these days I should put together a video or infographic of some kind to document some of the struggles I go through as I build my airliner template collection. I started this project four years ago (man, has it really been that long?) 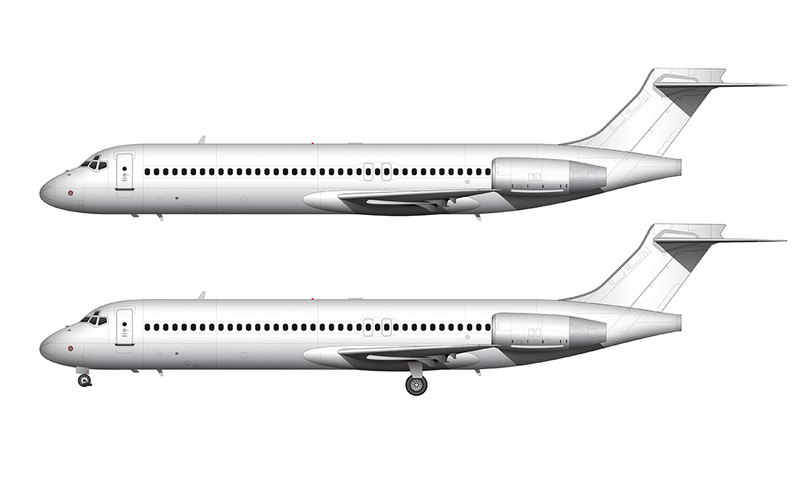 thinking that I’d quickly build up a large database of highly-detailed side view illustrations of the most popular commercial aircraft – past and present. It seemed like a simple and innocent enough project at the time, but…well, I’m here to tell you that I’ve “quit” three times already and each time I swore that I’d never draw another one of these darn things again. 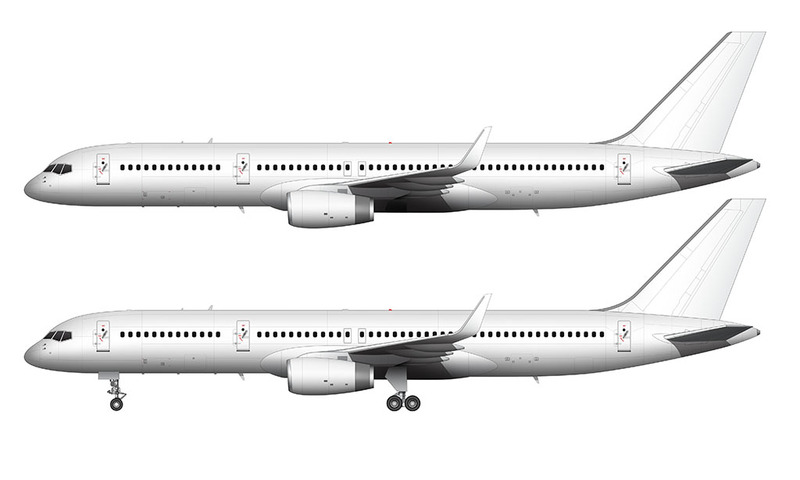 Yeah, I like airplanes, but creating these templates can be very tedious and draining at times especially when I’ve got a lot of other things to do. It also drives my short attention span crazy! But no matter how discouraged I get, I always come back to it. Contrary to my annoying short attention span, I have a bit of OCD in me as well that can’t stand the thought of having an unfinished collection of illustrations on my to-do list. I suppose this means that I’ll be working on this little project for as long as I live – no doubt struggling all the while and quitting a time or two along the way. And that leads me to my latest airliner illustration: the Boeing 747-8i (the “i” stands for Intercontinental). I started working on this one immediately after finishing my 747-400 template (more than two years ago), but…well…that was right about the time that I went through one of my “screw it, I quit!” periods and it was hurled into my archives presumably never to be touched again. But like I said – my OCD can’t let stuff sit like that forever, so I pulled it out last week and made a commitment to get it wrapped up and published. For those that don’t know, the Boeing 747-8i is the modern successor to the hugely popular 747-400, and most likely the final variant of the 747 ever. That’s especially true now since this airplane has proved to be less than popular and sales have been disappointingly weak since it’s introduction. There aren’t many airlines interested in four-engine aircraft these days, so it’s unknown at the moment how long the 747-8i program will live before Boeing pulls the plug on it. All in all, creating this template wasn’t so bad. The wing was (by far) the most difficult part. I wanted to give it a nice “flexed” shape that would accentuate the new-style blended winglet, and it was a bit of a challenge to get it right. At first I drew the wing with a downward arch (simulating how it would look with a full load of fuel), but I didn’t think it was the right way to illustrate it since the winglet curves up slightly. Therefore, I decided to give the wing a bit of upward flex to simulate what it would look like in-flight. Hello, My name is Shim who living in Seoul and love make concept of airplane painting. 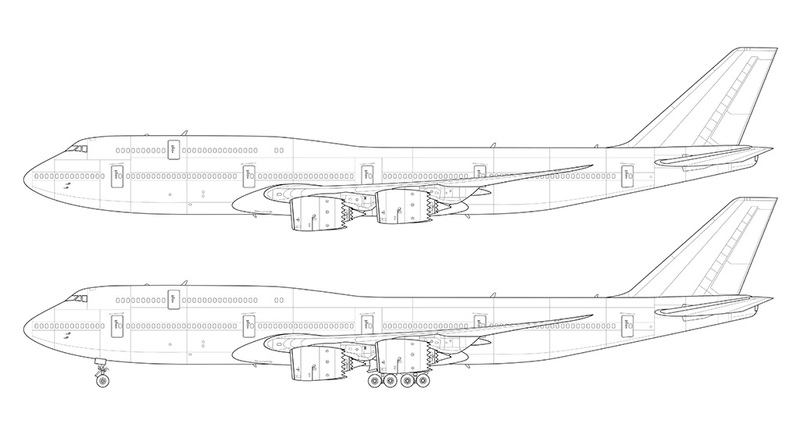 Without doubt, your’s B747-8 Intercontinental blank illustration templates have the best quality I ever saw ! If possible, I would like to get the original file(*.ai or *.psd ) for my personal creative activity. If you want to sell it at a reasonable price, I am willing to buy it with payment. But if it’s impossible, I have nothing to do with it. I respect your opinion. Definitely! I think I’ve got enough good reference material for the 737 MAX, but the finding pics and reference material A320 NEO good enough to create drawings from has been hard to come by. I’ll definitely do both, the the 737 will most likely be first. Hi Norebbo! I’m currently an engineering student doing a project about the 747 and was wondering if I could use your files in my presentation. Would you happen to have a .ai file for the blank templates? If so, would I be able to get permission from you to use it? Hey Ben – sure, feel free to use the images for your presentation. And thanks for asking! Regarding the .ai files, yes, I do have those but I’m not willing to distribute them at this time. Perhaps in the future, but for now I’m trying to keep tight wraps on my source files. 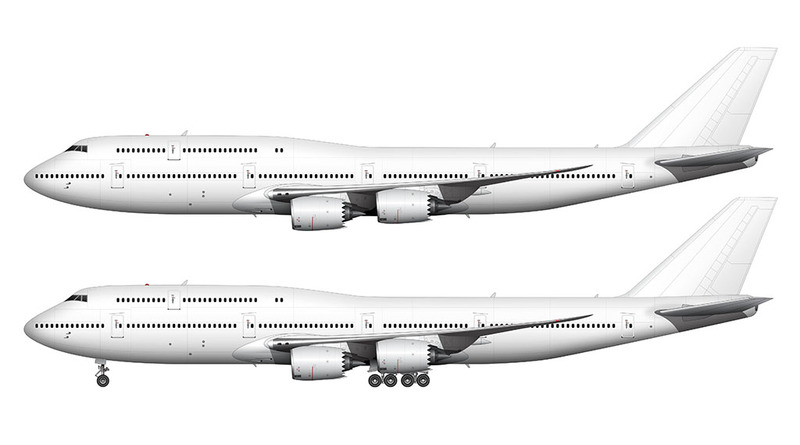 I don’t know if there is demand, but I want the template of Boeing 747-SP. Thanks Shim! All my my high-resolution source files (.ai and .psd) are available on my online store (www.shopnorebbo.com). Just let me know if you can’t find what you’re looking for! 1. What type of engines are on this version of the 747-8i? 2. Is there a slightly higher resolution version of the white background version of this picture (1024 x 614), like there are of other planes throughout your website? I wanted something that I could use to create a custom livery that I can have turned into custom decals for the new Revell Boeing 747-8 (1/144 scale) model. My girlfriend and I want to build that model over the summer, and I wanted to create custom decals that would be meaningful and special to her. When looking through the internet for the general shape of the 747-8 that I could use as a basis for designing the decals, your designs were by far the best.